Have an open position you are looking to fill with a great development professional? 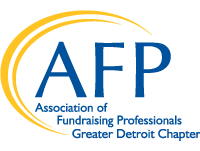 Post your open position to the AFP Greater Detroit Chapter job page and connect to nearly 400 chapter members and their networks of development professionals. We'll even send your listing out via e-mail to all active AFP Greater Detroit members! *Important- Your position announcement will not be posted until receipt of payment. * Please allow 2 business days for your position to be posted after receipt of payment. If you have questions about posting a position, please contact Jaclynn Cherry at accounting@afpdet.org. Click here to post a position.